1. First of all, you are directly on the beach with a beautiful oceanfront view! And we have 64 FIVE STAR REVIEWS... No one else has that. 2. It's a WEST end unit. This means there are windows in every room and its very bright. Also, because it's a WEST end unit, it is very private. Next to the building itself are privately owned homes, not another high-rise. 3. We are on the 5th floor so you look right over the homes to the west and are able to easily talk to family on the beach. 4. Our condo is the cleanest on the beach. Our cleaning people clean ONLY our unit. And the beds are comfy. 5. Its right on the Gulf, facing the ocean, and the views are spectacular. Gorgeous view of the sunset every evening! This is a full 3 bedroom, 3 bathroom condo with a wrap-around balcony! 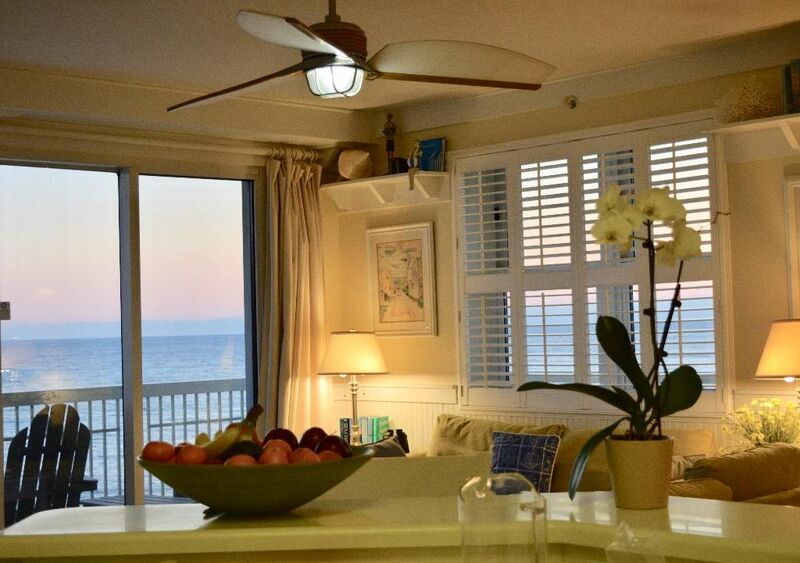 Beach Front--West corner unit on the 5th floor! Unobstructed view to Destin. It's a new property, very well-insulated and quiet. It's also the cleanest condo on the beach (our cleaning ladies clean ONLY our unit)! An indoor/outdoor heated pool is included, as well as a second pool near the ocean. Watch for dolphins, sting rays, and sharks, as well as families of pelicans flying by at eye level from the balcony. Check out the new Pier Park town center with its many restaurants and cute shops, 2 miles to the east. Just a short distance to the west we have several architecturally and nationally acclaimed coastal towns such as Seaside, Rosemary Beach, Alys Beach, and Water Color. Panama City Beach Information Center is nearby at the intersection of HWY 98 and 79. Miles of beautiful white sand beach to walk. Family friendly or a romantic getaway… this is the rental that you have been looking for! DON'T FORGET to check out the reviews from PREVIOUS RENTERS!!!! Growing up in Minnesota we always had a love for the ocean and often went there on our family vacations. After retirement we made a trip to Panama City Beach on a recommendation of a friend. We fell in love with the place with its white sand beaches, emerald green gulf water and the lack of traffic congestion. Throw all that in with the new Pier Park, new airport and all the many other new enhancements to the area and we couldn't buy our new condo fast enough back in 2004. We feel like we found a real winner in the 'new' Panama City Beach. I think if you just read the reviews you would understand what a wonderful condo this is. Our condo has a unique cottage style design, very open, bright and sunny. Closest Panama City Beach high rise to the quaint little towns of Rosemary Beach, Alys Beach, Seaside, Watercolor and others. I just love driving or biking through those towns. 5th floor wrap around balacony on west corner unit with beautiful views of the sunset. There is a Minimum Age Limit for Renters. A great family place at the beach!!! This condo is adorably decorated with a real beachy feel. Kitchen is well stocked with all your needs as well as beach towels and many sand toys for the kids. Seven of us had plenty of room and were able to share family dinners and game nights. The heated pool and hot tub were favorites for all. View is unbeatable, the beach is clean, and the people friendly. Corner condo with wrap around view of beach and beautiful sunset every night! Everything clean and beautiful! Great condo! Clean, nice, and the owners are very easy and nice to work with. Thanks again for another wonderful stay! The place is lovely! Beautifully decorated and accommodations are perfect. Comfortable and right on the beach. Sunrises and sunsets seem to be right in your hands! The only sad part is leaving. This is our 2nd stay, and we plan to come back again and again. Ron, the owner is very accessible and will address any questions (though there won’t be many cause everything is completely laid out for you). If you’re thinking of renting here, go ahead and do it - I promise you will not be disappointed! My husband and I want to Thank the owners for opening their wonderful home to us, and we feel it’s our Panama City Beach Home-Away-From-Home! This beautiful corner condo has AMAZING views of the beach and comfortable beds!! We had a great time here. The condo was perfect for our family and it was nice and easy to work with Ron. The furnishings were nice, the kitchen well stocked with cooking utensils and everything was clean. The view and location are perfect. We would definitely come back again. Awesome Rates for 2013. Email or Call 612-722-7612 or 612-532-7036.